In the last 7 days, Busan people only used Google to find Naver ! Ok, that’s not directly a Busan citizen who told me this. 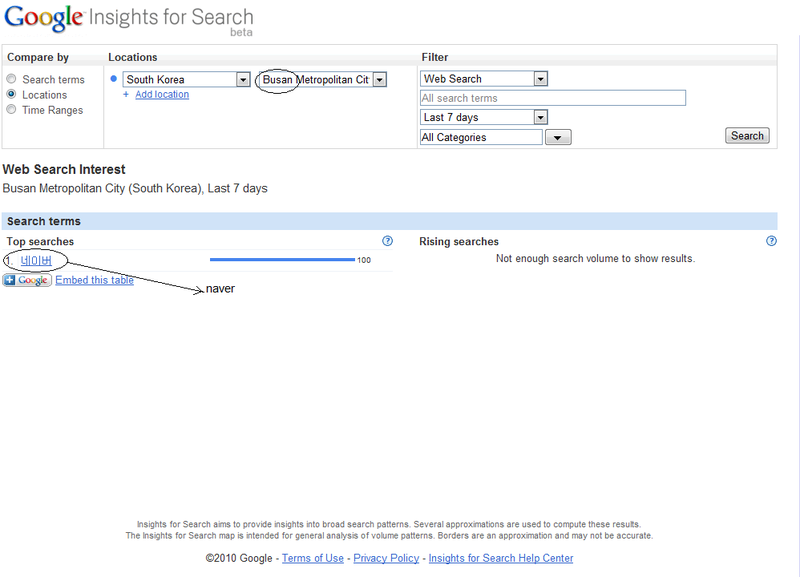 I used Google Trends to search the last keyword trend in Busan region. What I found is that the only keyword (compared to other countries) is 네이버 which is the name of Naver. Naver is the Google Killer in Republic of Korea. For what I know, nobody uses Google. Even my wife, in France, uses Naver to find places in Paris. Why ? the philosophy behind Naver is totaly different. It could be seen as a Yahoo-Google merge. Powerfull. Korean I met like to have more info on one page, they feel that Google’s homepage is empty. By the way, I read somewhere that Google changed it’s front page in Asia to make it more attractive and less empty. Question of design taste. there are more information coming for more blogging people. Because people blog more in Korea. They take pictures of food, of restaurant, addresses, tutorial on how to get refund from duty free… So specialized. There is a human response for everything compare to just machine keyword analysis. Busan is the second largest city in Korea. This is where I went most of the time when I traveled in Korea. This is the city of my wife’s familiy. Why are Busan People using Google to find Naver ? Do you have an explanation ? I think it’s a statistics artifact.